Someone help me–I just can’t stop with the comfort food makeovers! Maybe I should rename this blog “comfort classic makeovers”. Catchy. Did anyone else grow up with spaghetti pie? Because the Olson household was all about it. When I saw that Lindsay, a fellow Minnesotan (and rock star food blogger) about my age, posted a spaghetti pie recipe on Pinch of Yum this summer, I was like, “It’s a Minnesota thing!” Because you know east coast Italians would not defile their spaghetti this way. She responded that she actually didn’t grow up with it, but I think it still proves that spaghetti pie runs in every hot dish-loving Minnesotan’s blood. It starts in a pie plate (obviously), which is filled with heaps of spaghetti noodles mixed with egg and cheese and sour cream, followed by a thick layer of meaty red sauce, then topped with shredded mozzarella cheese (Mom, correct me if I got anything wrong). The egg mixture binds the noodles together into a dense baked spaghetti brick kind of thing, but in the best way possible. You have to taste it to believe it, because every word I’m coming up with to write about it sounds less than appetizing. Firm? Chewy? No. Basically it means you get more spaghetti and a perfect balance of noodles and sauce in every bite. Then serve it up alongside an oven-warmed, butter-soaked loaf of garlic bread and you have a comfort food dinner that dreams are made of. Buttttttt a certain Olson family kind of doesn’t eat processed wheat anymore, which poses a major roadblock between me, spaghetti pie, half a loaf of garlic bread (just being honest), and a glass of red wine. Consistent with my food philosophy, though, I don’t buy that cleaning up your nutrition has to mean a boring piece of chicken (which can, in fact, also be quite dangerous for your health) and a side of unsalted, blanched broccoli for dinner. Most of the time, it should mean cooking with whole food, unprocessed ingredients. Like squash, as opposed to mass manufactured spaghetti noodles. So when I was gifted a spaghetti squash at my parents house this summer, it was like a lightning bolt hit me. People are cray for pretending spaghetti squash strands are real noodles, so why haven’t I seen a spaghetti squash pie recipe yet??? Probably because it isn’t quite as simple as just swapping out the noodles and swapping in spaghetti squash. The first experimentation with the pie was satisfactory. It led to me creating my mushroom marinara recipe (fresh produce = kitchen creativity), so flavor-wise, the pie was awesome. My parents and I (only three people, mind you) nearly finished off a single deep dish pie, which I constructed in a huge glass BOWL because it wouldn’t fit in a pie plate. It was quite a sight to see, but I have zero pictures, because it took way longer to make when I did the sauce in the same day, and I was in a rush to get dinner on the table for two hungry cyclists. 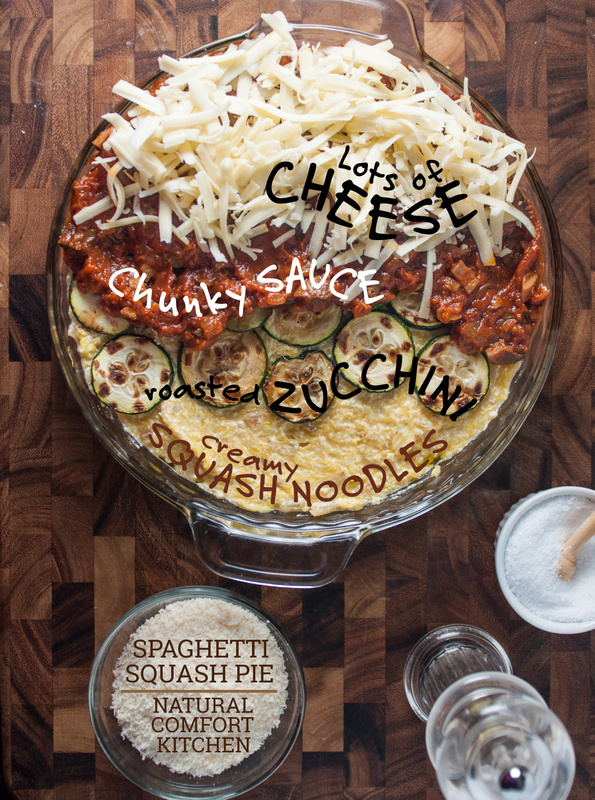 Aside from revamping the recipe to fit in a normal pie plate, there was a moisture issue–all the zucchini and spaghetti squash produced kind of wet pie, which never quite set up like the original firm recipe. Hehe. Or dense. Turns out I could solve both of my problems by pressing out extra water from the squash after I cooked it, and I was amazed that a four pounder produced around 3/4 a cup of water! As you can imagine, that cuts down on the sheer mass of squash noodles and it helps the egg and ricotta stick to the noodles better, because they’re not slippery and wet. Think about trying to make scrambled eggs with equal parts water and egg. While I haven’t tried this, your egg probably isn’t going to set because you’re introducing too much moisture into the mostly fattiness of the eggs. Same concept. Throwing tons of water into the mix of “noodles” and fat throws the expected results. Here we are five paragraphs in, and I’m still talking about the spaghetti pie. 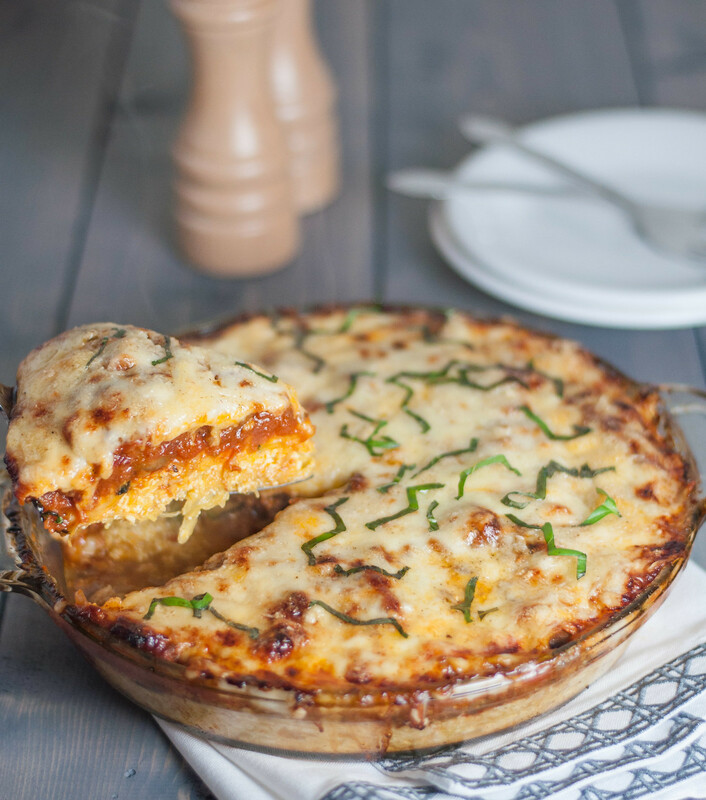 Perfect, gluten-free, noodle-free, meat-free (if you like) spaghetti pie. On trial number two, there was zero doubt that it worked. I don’t think Steve or I came up for air until after we cleaned our plates on the first serving, and if you’re a home cook to any extent, you know silence is the ultimate praise. Here’s the recipe for my mushroom marinara, which is awesome in this pie! Note: The recipe was updated in January 2016 to fine tune the ingredient quantities and make the recipe (hopefully) easier to follow. The only major changes are slightly more squash, so the pie easily serves 6, and an additional egg for a firmer pie. If you’re trying to watch your egg intake, two eggs will work just fine! You don't need to do your ingredient prep before starting the recipe--it's all included in the instructions, to be done while the squash cooks. Preheat oven to 375 (F). Oil, butter, or spray a standard pie plate or 2 quart baking dish (for closer to 5 pounds of squash, use the 2 quart dish). Cut squash crosswise into four equally thick rounds and lay on a baking sheet. Sprinkle with salt (no oil) and bake for an hour, flipping over halfway through. Coat the bottom of a medium skillet thinly with olive oil, and heat thoroughly over medium high. Add all the zucchini that will fit in a single layer, and fry on one side for 3 to 5 minutes, until golden brown. Flip over and fry on the other side, remove to paper towels to drain, and sprinkle lightly with salt. Repeat the process, adding more oil to the pan as needed, until all the zucchini are fried. Set aside. For a very firm pie, place tomato sauce in a fine mesh strainer set over a bowl and stir once or twice, to drain excess water. Heat a teaspoon of oil in the skillet from the zucchini over medium heat. Add onion and cook 7 to 10 minutes, stirring occasionally, until softened and moderately browned. Remove to a large mixing bowl. When onions have cooled slightly, add half the parmesan, the ricotta, eggs, a teaspoon of salt, and ¼ teaspoon of pepper and stir together. When the squash is tender and has cooled slightly, run a fork around the inside of the rounds to shred it into “noodles”. Place squash in a colander over the sink or a bowl, and press out as much water as you can—there will be quite a bit! To really dry out the squash, spray the baking sheet with olive oil spray and spread the noodles in an even layer, then heat in a 250 degree oven for about 20 minutes. Add squash noodles to the ricotta mixture and stir to combine very well. Spread squash mixture into the prepared pie plate. Top squash with an even layer of fried zucchini, then gently spread all the sauce over the zucchini. Top with the fontina or mozzarella, the remaining parmesan, and a pinch of black pepper. Bake on a rimmed baking sheet (to catch overflow) at 375 for 30 minutes, until bubbly and cheese is melted. Increase oven temp to 425 and bake 10 more minutes, to brown the top layer of cheese. Cool briefly, then cut into slices and serve with freshly sliced basil. 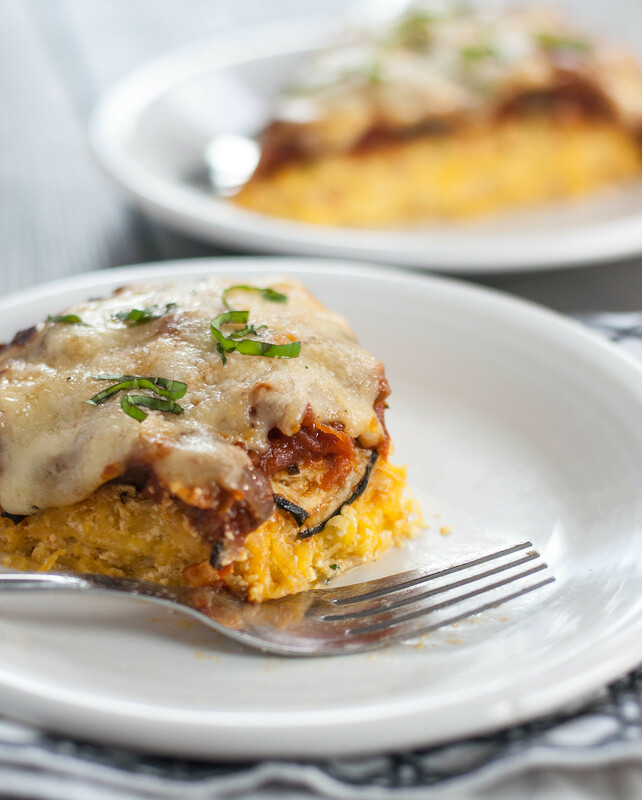 This spaghetti squash pie looks SO delicious. especially loving your incredible photography of it too! Thanks for the great recipe, it’s definitely one I have saved to recreate!! Thalia, it’s definitely one of my new favorites! Still have some leftover from testing in the freezer and I can’t wait to eat it! That looks amazing! Can’t wait to try. Question – do you cut the spaghetti squash like that for a reason – as opposed to just halving it? I found an article that explained how the “noodles” actually run around the circumference of the squash, so I wanted to test it. It’s true! You can get longer “noodles” by cooking it this way. I imagine the cooking time is also less in these smaller pieces. If neither is a concern, feel free to halve it if you’re more comfortable. Enjoy! Do you know the a calorie count per serving? Ashley, I don’t. Probably a little over-explanation, but the reason I don’t share nutrition facts is because everyone’s body is different so government standardized daily values don’t necessarily make sense for every single person. This dish won’t come out super low fat because of the cheese and egg. If that’s something you’re watching, I’d say make your serving size smaller and fill the rest of the plate with veggies or salad. It freezes great if it takes you a while to get through it! Hope you try it out! Spray your glass baking dish (I use a Pyrex casserole dish) with cooking spray and set aside. Cut the spaghetti squash in half vertically. This takes a bit of effort. Place each half cut-side down onto the baking dish. Cover tightly with plastic wrap. Turn your microwave’s turntable OFF. Place dish into microwave and set it to HIGH for nine minutes. Let it rest a few minutes. (Be careful when you remove the plastic wrap due to the steam!) Check with a fork to see that the “guts” of the halves and done. You may have to place squash back in for a minute or two. Use a fork to first remove the seedy pulp. Then use your fork to scrape out the spaghetti – which comes out quite easily. Voila! This is a great recipe! The only changes I made were to add garlic powder to the squash (once it was scraped into the bowl – AND – to use a potato peeler to cut the zucchini into ribbons. 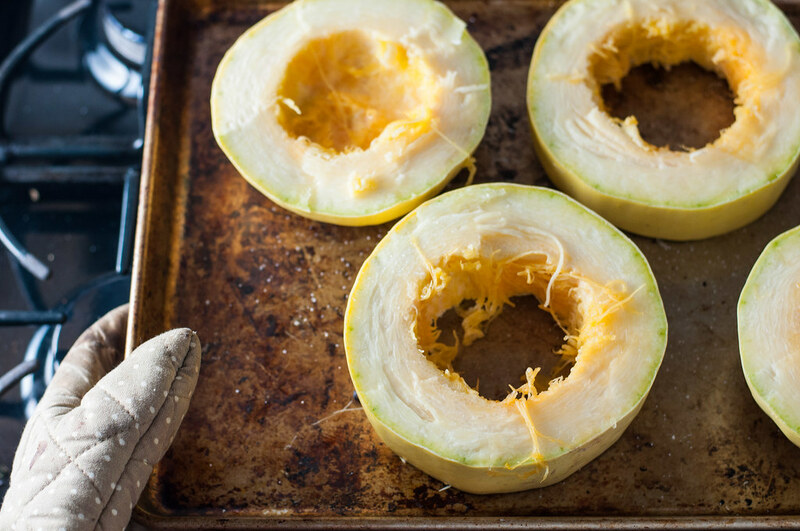 Shelley – Thanks for the quick cook method for the squash–that’s an awesome time saver. Glad you enjoyed! Microwaving food greatly damages the nutrition in it…& plastic wrap should NEVER be used when cooking food!!! Very interesting article. I still will not use a microwave for cooking simply because I love to slow roast my veggies in’s the oven in glass pans and I have the time to do so. Also, EMT’s are high with micros and I try to keep this as low as possible in my home. I never use plastic wrap because it is not friendly to the environment. There is always a lot of fear of new things. Like brain cancer from cell phones, well, they have been around a long time now and I have not heard of one case of brain cancer. So it all comes down to individual beliefs. Harvard studies are interesting because many of them are backed by the very people having the study done. Like the one being done now to block out the sun to prevent global warming. That is a Bill Gates thing. Thank you for sharing. I always love another point of view. Even easier way to cook spaghetti squash is to wash the outside, then pierce well with a fork. Pop it in the microwave for about 10 minutes, It’s then easier to cut and seed. This looks incredible! I just wanted to let you know that I have a food photo submission site (Simply Creative Recipes) and I am linking to this post if you don’t mind. You are welcome to submit your recipes if you’d like. I cannot use eggs, because my granddaughter is allergic. What else can I use? 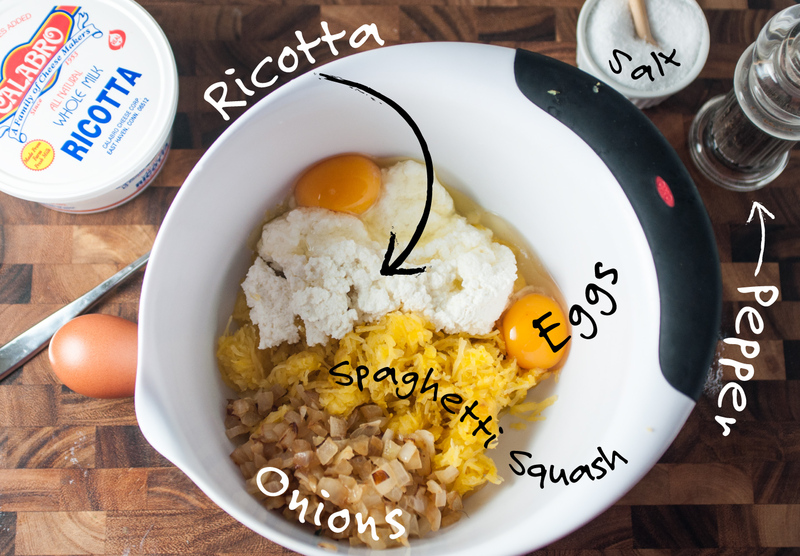 The purpose of the eggs here, as you may have guessed, is as a binder to help “glue” the squash noodles and ricotta together, and give it a firm consistency so it cuts like pie. I did a little research for you, and I’d probably recommend an egg replacer (such as Ener-G) as the best choice. If she can’t have that, a bit of breadcrumbs may help do the job, as the moisture from the ricotta soaks into them (that will obviously render it not gluten-free). I did find an interesting suggesting to use an equal amount of silken tofu–I haven’t tried it but it seems like it should work. Do let me know what you try and how it works–it would be super helpful to update the recipe for an egg-free option! If she’s young, it’s a great kid-friendly dish, too! You can try Flax meal as well. How did you cut the squash into rounds??? Sheral–I just sliced it into about 2″ thick pieces, using the tip of a knife to make an incision and remove the seeds as each slice lay flat on the cutting board. Basically I was just really careful not to cut my fingers off in the process–go slow and steady. Slicing the squash this way seems to help it cook a little faster than halving it lengthwise, and you also get longer strands of “spaghetti”. If neither of these is highly important to you, feel totally free to cook the spaghetti squash using your go-to method. The more traditional method is detailed here. I’m 11 weeks pregnant and can barely eat anything. Nothing sounds even remotely edible and the morning sickness has me not even wanting to try. But this sounds SOOOO good!!!! I almost want to make my husband run out and get the ingredients RIGHT NOW so I can make it haha. I’ll probably throw some chicken in there and use canned sauce and a container of parmesean instead because I’m lazy and my toddler hates when I’m in the kitchen lol. I am baking this right now! One thing I did differently was after baking I strained then sauteed the squash with the onion for awhile and it helped the moisture dry up naturally and became more sweet! Yum! That mixture alone with the salt/pepper and a little olive oil could have been the whole side dish it was so melt in your mouth. But, I obediently assembled the ingredients and added pepperoni instead of zucchini to the top layer before the cheeses. OKAY, the taste is amazing – the salty sour of the pepperoni and the faint sweet of the onions are perfect! Thanks for adding some variety to my life. 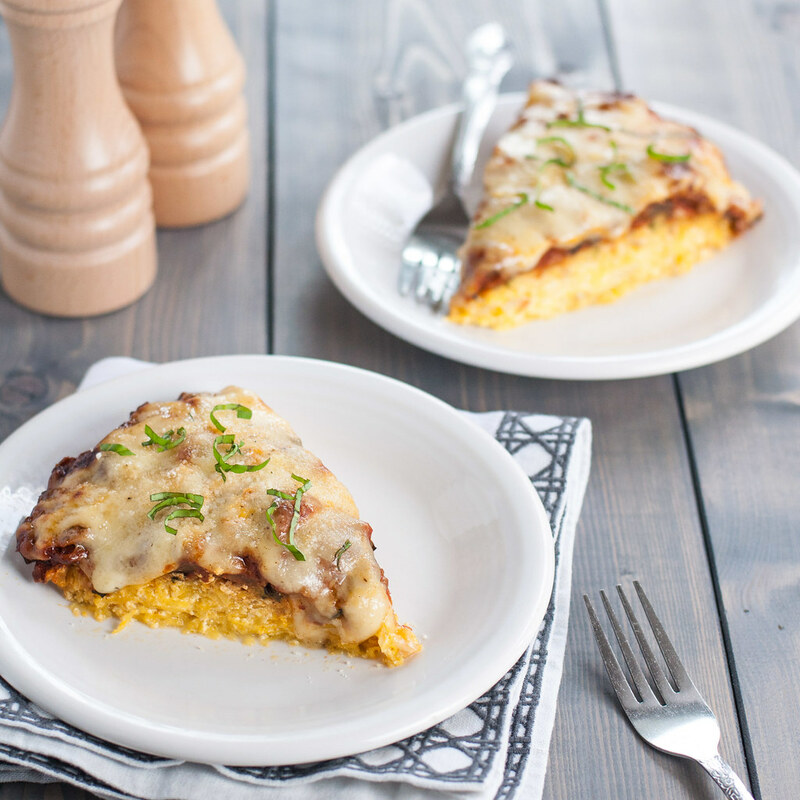 Um, PIZZA spaghetti squash pie?! Love it! And good thinking on the sautee! I’ll try that next time I make it. I made this tonight! Delicious! I made my own marinara (with ground beef). I baked the spag squash mixture for a bit first, then topped it off with everything else. Turned out perfect. Thank you! Baking the squash mixture first–also an awesome idea. So many good suggestions in these comments! I plan to make this, but wondering why you say regarding boring chicken, “(which can, in fact, also be quite dangerous for your health)”. What makes you say that? Hey Kris, in all sincerity, thank you for posting this as an open-ended question, not a harsh anonymous comment! After learning about all the benefits of a plant based diet, and the way most conventional chicken (and other meat) is produced, I pretty much stay away from it. Often, chickens can be overcrowded and the conditions are conducive to infection. I try to share bits and pieces about my evolving nutrition philosophy in posts now and then, but for more specifics on that issue check out the videos at nutritionfacts.org or the book The Omnivore’s Dilemma, which presents a neutral, factual stance, without guilting the reader into anything. Thank you for the wonderful recipe, I’ve added all the ingredients to my shopping list. And Thanks too, to all your readers posts for the other ideas and results. I’m coming to grips with having to adjust my lifestyle to becoming gluten free and blogs like this are proving to be a godsend. Just wanted to add that the photography was great and the instructions were clear, concise and easy to follow. Debby–thank you! Always looking for helpful tips. I’m coming to discover that whether you’re a new home cook or have been through culinary school, we all can help each other out in the kitchen. Probably why I love the food blog world! Thanks so much for your feedback and compliments, and let me know if you have any requests in the future for specific GF dishes. Alex, I think you might have some luck with spiralizing the zucchini, sprinkling with salt, then pressing out the excess water. The main issue with zucchini is they’re just very watery, even more than the spaghetti squash. If you’re not watching carbs, you could also go for gluten-free or regular angel hair or spaghetti pasta. Would you happen to know the weight watchers points plus value for this dish? I’m sorry, Kate, I don’t! I did just google “Weight Watchers Points Calculator” and there are a few sites with calculators, so you could probably piece together a somewhat accurate estimate. Can’t wait to try this! Thanks for sharing. Looks amazing! Ronell glad you discovered it–hope you love it! In the oven right now. by default I made a double batch but didn’t have enough cheese, so I froze extra the ricotta/squash portion in a 9×13 pan and made a complete 8×8. Excited to see the results. Me too! Let me know how the freezer batch turns out, and I hope you liked it! I cook my spaghetti squash by stabbing it 4-5 times with a sharp knife, to let out steam, and pop it into the microwave for 10 min. Sorry! It’s kind of hidden in the post. I’ve added a link right into the recipe. Let me know if you have any trouble! Sounds like a good recipe, however , there are way too many steps and procedures for me to mess with. Maybe if I were younger and had more patience, I would make this. As it is, I only make recipes with fewer steps, less mess & utensils, and much less time involved. Not a criticism, just how I live today. LJ – it is a little bit prep heavy! If you’re looking for another cheesy pie recipe, you might want to check out my cheddar sweet corn pie–it’s fewer ingredients and much less time! Bake your spaghetti squash halves, make the strands, season (and mix in some xtra virgin olive oil) then pile on the other ingredients and bake to get the cheese melted, gooey and browned a bit on top. Highly recommend, so good and fun to eat! I have a big pot that I can boil the spaghetti squash in. I cook the squash till I can pierce it with a fork. Then I half it, remove the seeds with a spoon and separate the spaghetti with a fork. I will try the microwave method as I don’t care for the baked method. Made it tonight. Amazing. Thanks for the recipe. This is a delicious recipe! I followed the recipe exactly. Even made Mushroom Sauce. It came out so beautiful I took a pic ~ was hoping to post it here but there isn’t a way to. What is the best way to store and reheat leftovers? Hi Jessica–you can store right in the pie plate in the fridge for a few days, or wrap or package slices individually in plastic wrap or food storage containers. For freezing, I’d wrap slices or a quarter of the pie in plastic wrap, then load them into a freezer bag or another layer of wrap. To be honest, I usually just microwave my leftovers (thaw them if frozen). However, for the oven, I would reheat around 300 degrees loosely covered with foil on a baking tray or other oven safe dish, until warm (check at 15 minutes). Enjoy! Jane, I’m almost certain it will still taste good. Sautéing the squash, though, probably affected the moisture level (either too much or too little, depending on how long) and overcooked the squash. Keep me posted on how it turns out! You can get the water out of the squash by using a salad spinner. How do you like the trick? As for the taste, I don’t know yet, it is still in the oven. Hey Lisa, the sour cream is part of the story of the spaghetti pie of my youth (no meaty sauce in my version, either)…I use ricotta here instead. Love the salad spinner idea–that is seriously one of my most used kitchen tools. I’ll give it a try next time. Hope it turned out delicious! Funny, I am also from Minnesota. I have been making spaghetti pie for years and years. In fact I usually double the recipe and make a spaghetti cake, because it is so well loved. A few months ago I tried subbing spaghetti squash for the noodles. It was delicious, but I discovered that I did not remove enough of the liquid from the squash. I will definitely be trying your recipe! Spaghetti cake?! OMG, yum. More to love. And yes, liquid removal is the one crucial key for subbing the squash. Squeeze the bejeesus out of those noodles. Hope it comes out perfect for you. Hi Tesasa I just saw your spaghetti squash pie recipe and it looks very good. I see it calls for 2 large eggs & I was wondering if Egg Beaters Beaters can be used in place of the eggs since 1/4 cup egg beater = 1 egg we do not really use much regular eggs in our house mostly use egg beaters? Hi Colleen! Personally I’ve never used egg beaters, so I would recommend following the substitution ratio on the package. This is a pretty conventional use of eggs as a binder, so there’s a good chance it will turn out well. Let me know! Hi Tessa, I’d like to make this ahead of time and freeze it. I wonder how yours was after thawing and eating it. Also, the “extra dry” prep is a good idea if one freezes it to minimize the soupiness that happens with veggies after defrosting. What do you think? Mine thawed just fine–delicious actually! I think it’s a great idea, especially if it will help you eat well on an otherwise time-crunched night. I live in Wales and don’t know what spaghetti squash is – is this what we call butternut squash? Will try recipe when I know what squash to use. Hi Jeannie, thanks for reading! Given how trendy spaghetti squash is, it never occurred to me to explain it–apologies. Wikipedia tells me it is also known as vegetable spaghetti; not sure how helpful that is. It is an oblong, yellow (usually pale) winter squash. When cooked, the flesh of the squash scrapes out in strands resembling spaghetti noodles. Is that something you’re familiar with, maybe by a different name? Thanks Tessa, the way you describe the squash I’m pretty sure it’s what us “Brits” call Butternut Squash. (Makes a delicious soup too). Will definitely give your recipe a go. I had no idea, so that’s good to know. It’s actually the most popular recipe on NCK so I will update it for my overseas readers like you! let me know how it goes if you think of it. I used fresh mushrooms instead of the zucchini and prepared them just like she did the zucchini. I used canned chopped tomatoes seasoned with Italian spices instead of the spaghetti sauce. I laid a few pepperonis on the top before I baked it. 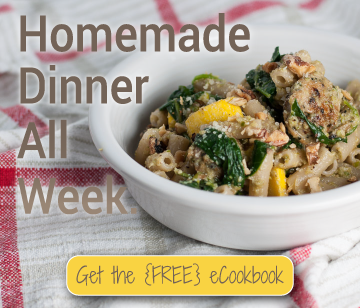 I would made it the same way – thanks so much for the recipe!! Pam, you’re welcome! All your changes sound great. Awesome! I actually posted it on my Instagram in honor of Pi day :) Lucky coworkers you have if you’re sharing. Thanks for a great recipe. I made it for dinner with baked fish on the side. 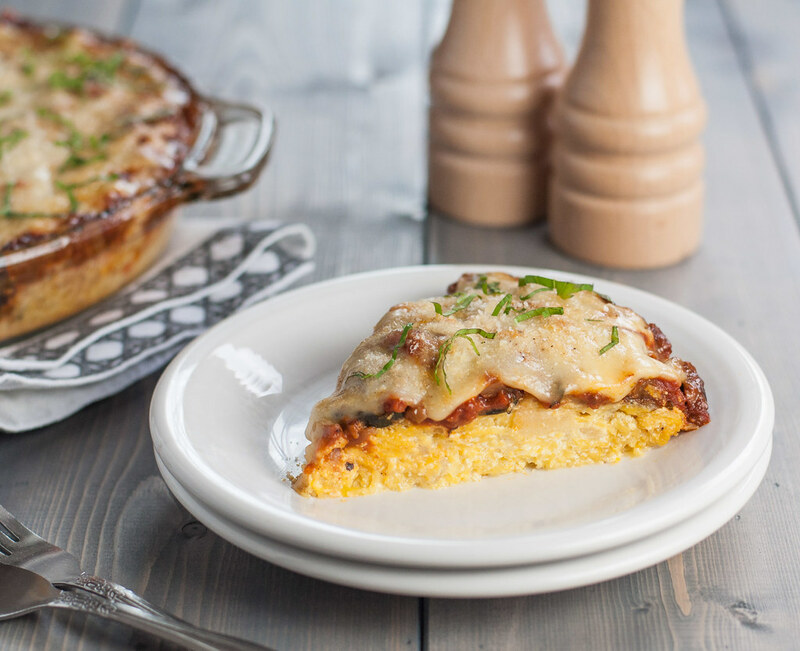 Just tried your Spaghetti Squash Pie! It is coolong as I text. Look great! Wish I could attach a picture. I am very proud that it turned out so well! Thanks!! Thanks Beth! That’s awesome it came out so well :) If you use Instagram or Facebook you can tag me in a picture–I’m “Natural Comfort Kitchen” on fb and “naturalcomfortkitchen” on Insta. Would love to see it! Hi Amy! As it cools it will let off some steam (moisture), depending on whether it was covered or not. I would just give it a quick squeeze/press in your hands or through a colander to make sure you have any significant extra liquid out before proceeding. Hope you like it, enjoy! Made this recipe tonight. It was like a spaghetti squash lasagna. My 17 month old loves spaghetti squash and appeared to enjoy this dish. I think next time I will add some spinach (got to get it in him some how). Maybe even some extra protein (tofu or ground meat). Thank you for the recipe. Love new ways to serve spaghetti squash. Thanks for the comment Angela! Since I don’t have kids in the house I love to hear when my recipes are truly kid friendly. Love your ideas for next time! Love your receipe. I’d love to feature your website on my new blog that I’m just starting. Hope you have Blessed day. That’d be great Patricia! There’s info on policies about linking to my site in the About menu. Thank you! Marissa, that sounds awesome! I’m pinning that sauce recipe and will have to give it a try–looks delicious and healthy! I am regular reader, how are you everybody? This post posted at this site is genuinely good. Made this tonight! I added grass-fed ground beef to the sauce and sauteed mushrooms over the zucchini layer. It was a lot of prep but quite delicious. :) Thanks for the recipe!! It definitely reminds me of lasagna. Tiffany–it is a TON of prep, which is why I’m always so shocked at the popularity of this recipe on the site! But it is worth it :) The mushrooms sound awesome–love them. Thanks for adding your feedback! nail on the head. The problem is something not enough folks are speaking intelligently about. How many carbs? Looks good. Hi Alice–I don’t count carbs, so I’m not even sure what the measurement would be, but since the pie is made with squash, instead of pasta, it’s pretty low carb. I would say take a look at the individual ingredients and evaluate where they fit in your diet. Thanks! Do you know the carb count? I’m doing keto, so that would be helpful! Or if you know of a site where I can enter the ingredients to get that info. Just made this and I love it. Put in baker instead of pie dish. Will make again. You can also cook a whole spaghetti squash in the slow cooker. Make sure you pierce it a few times with a fork (so it doesn’t explode) and add an inch or so of water in the bottom. Cook until it “gives” slightly when pressed with a finger, then proceed with the rest of the recipe. Just made this – SO GOOD! I’ve made 100 different spaghetti squash casseroles and this has the most flavor by far. I did add garlic and ground beef – dee-lish!